I have been highly critical of the general OLPC approach, which emphasizes mass distribution of XOs to children in the poorest countries, with neither pilot programs, nor evaluations, nor sufficient attention to the broad array of social and technical factors that help make a laptop program work. At the same time, there have been some encouraging signs from Uruguay that its "Plan Ceibal" might be different, at least in some ways. Recently, I had the chance to review two recent Spanish-language reports and an earlier third report on evaluations of Plan Ceibal conducted in Uruguay, and discuss the reports extensively with members of one of the Uruguayan evaluation teams. Here are my thoughts. As discussed recently in OLPC News, the social and economic context in Uruguay is quite different than in many other OLPC targeted countries, such as Rwanda, Haiti, or Ethiopia. In contrast to these poor nations, Uruguay is a middle-income country with a per capita GDP in the $9-10,000 range (or $12-13,000 when measuring by purchasing power parity). Uruguay also has a stable democratic government, a comparatively low level of corruption, a decent educational system, and universal literacy. 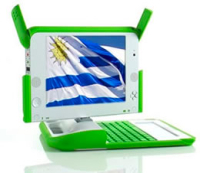 Uruguay has also gone its own way in implementing the national laptop program, adopting certain features of the OLPC model (such as child ownership and use of the XO laptop, which was adopted over other laptop models following a competitive bidding process) but ignoring others. For example, while OLPC leadership has badmouthed pilot programs, staged implementation, and formal evaluation, Plan Ceibal has included all three of these elements. In addition, unlike in some XO implementations, substantial resources to the infrastructure needed to implement a successful laptop program have been devoted, especially in promoting connectivity (indeed, the very name of the program is "Conectividad Educativa de Informática Básica para el Aprendizaje en Línea" (Educational Connectivity of Basic Computing for Online Learning). An apparently massive investment has been made toward the goal of making wireless access available in almost every classroom of every school in the country (save a handful of schools that either lack electricity or are extremely isolated geographically, and solutions are being considered for those cases as well). This infrastructure is also being extended beyond the school, with the goal of bringing a wireless hot spot within 300 meters of every home in small towns that have at least 50 pupils in them, and in major gathering points (squares, clubs, etc.) in big cities. Substantial resources have been devoted to repairing and maintaining the XO's as well, with the government reportedly making a commitment to repair for free any XO's that malfunction following proper use and to subsidize the repair of laptops that break due to user error. As for social support offered to the program, for example via teacher training and support, there appears to be much room for improvement, but at least the amount of teacher training offered (reportedly up to 8 hours per teacher) has been greater than in some other OLPC implementations, and teaching mentors have also reportedly been appointed to assist teachers' development. 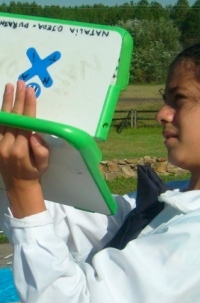 What do you see in OLPC Uruguay? Home use: Children reportedly use the XO's about an 1 to 1.5 hours per day at home. Major home uses (in order) are playing games, taking pictures, writing, drawing, and searching for information for school. Family members use the XO's quite a bit as well. Children from poor families who lack other computers make use of the XO's the most and feel the most benefit from home use. The major displacement of activity to make time for using the XO is from less time watching television. School use: The XO's are not used as much in schools. About 1 in 5 teachers report using the computers for individual work daily or almost daily, and about 1 in 8 teachers report using the computers for group work daily or almost daily. Only 1 out of 30 report assigning homework on the XO's. Principal school activities are navigating the Internet and writing. Public attitudes: Survey data suggests that the XO program is broadly supported by children, parents and school principals. Principals report that children are more motivated and self-confident. Many of the benefits appear to go disproportionately to low-income children who previously lacked access to computers and the Internet. Repair: Some 20% or more of XO's are reportedly out of working condition at any time, with the number rising among those who have had the XO's longer and among low-income families. Compared to laptop programs I have investigated in the U.S., which typically involve school ownership and maintenance of laptops rather than child or family ownership, school use of laptops in Uruguay is still very much on the light side. In a typical laptop program in elementary school in the U.S., the majority of teachers have students use the laptops every day, and often for several hours a day. Of course, with additional teacher training, it is hoped that the amount of school use will increase over time in Uruguay (though, if laptops continue to break down, it is also possible that school use could decrease). Meanwhile, the amount and variety of home use is of interest. Yet to be seen is both how this will be sustained over time, and what impact such use might have on children's social and educational development and economic opportunity. Research from other countries is ambiguous on the impact of children's use of computers at home, with some studies suggesting educational benefits and others indicating the opposite. The widescale positive reception of the Plan Ceibal program, especially as regards its impact on poor children and families, is encouraging; whether families' hopes for the program will be met remains to be seen. As for the future of the program, the reports suggest that upcoming challenges include (1) training a wider number of adults to be able to monitor and support children's use of the XO's so that such use enhances learning; (2) paying particular attention to children who principally use the XO's for entertainment or amusement so that they diversify their activities and uses; and (3) finding more ways to avoid breakage of the XO's and minimize the impact of such breakage. Overall, I am impressed by the work of the evaluation teams and their identification of the kinds of social support necessary to make a laptop program more effective. If their recommendations are followed, that could help strengthen the program. The bottom line is that CEIBAL appears better designed and supported than many XO implementations, as evidenced by Uruguay's large investment in extending Internet access. Indeed, that alone could prove to be the most important part of the program, given a recent World Bank report that suggests that each 10 percentage point increase in high-speed Internet access in a country brings 1.3 percentage points increase in economic growth. At the same time, school use of the laptops remains low, as found in many other XO implementations, and social support for better usage could likely be improved. The jury is still out on Plan Ceibal's long-term impact, with other countries in Latin America and around the world likely paying close attention. which more information on this talk is also available. The OLPCnews.com community is certainly welcome to attend and participate. I wrote this blog posting, but I did not write the title. My title was the decidedly more neutral, "Thoughts on Plan Ceibal," but Wayan changed it. OK, 1 in 5 use the XO daily or almost daily in school. Does that mean that 80% of the XO's are used less than 3 times a week? What is the reason that it is not used more often? Where do they get the parts, since 20% are broken at a given time? Does this cause the XO is used less often, since not all the children have their laptop available to complete their assignments? I think it will be most interesting to see the solutions proposed for extending internet to those briefly mentioned rural schools where electricity is either at a premium or non-existent. As this will be serve as a notable comparison for the implementation process used in that portion of the Uruguay project vs. the Ethiopian project for example where similar connectivity issues were seen. I think having a school network like done in Micronesia might be a good way to get around the lack of the internet. Once a day downloads and uploads could happen. I do not know if Sugar could do this automatically, but this would lower the electricity needs having a dedicated school server left on all day. Another option is adopting a XS platform based off a low wattage netapp or notebook platform, then deep cycle battery technology with solar recharging becomes a viable option. The most challenging part however I see if connectivity even if you do once a day upload/downloads it still takes infrastructure to pass those uploads/downloads. Several solutions have been floated but very little has ever been done integrate low cost connectivity into any of the OLPC projects world wide. Bitrate is of significantly lower importance than base connectivity and while this can be done over notable expanses of distance and terrain with rather low power OTS equipment it has never really been embraced for one reason or another. I am using a 19" TV/Monitor, Asus Eee Box desktop, Cable Modem, and UPS backup power. It uses 65 watts of power. Lowering the energy needs of the server allows for about a 75 watt solar panel to run my whole operation. I have seen it struggle under extreme heat and processor power needs, even with it using an internal fan. Planning to use solar panels and deep cycle batteries are a given to me. I could operate my items directly off of 12V power to save more electricity. In writing this post, I neglected to acknowledge and thank Ana Laura Martinez, Coordinator of Monitoring and Evaluations of the Social Impact of Plan Ceibal. Ms. Martinez spent a couple of hours on the phone answering all my questions about the project, and I found her to be extremely thoughtful and knowledgeable. The fact that Plan Ceibal has such thoughtful and well-informed researchers working on their evaluation impressed me as being very positive (in spite of the real challenges they face).